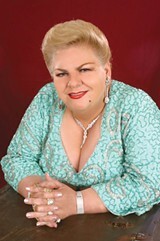 Paquita performs on Saturday, April 6, at the Wells Fargo Center for the Arts. 50 Mark West Springs Road, Santa Rosa. $60–$100. 8pm. 707.546.3600. All Woman In Paquita's songs, men are two-legged rats who deserve to die. To those who don't have an appreciation for ranchera music, it may be hard to imagine why a woman who resembles Mimi from The Drew Carey Show has such a large fan base. Francisca Viveros Barradas—or, as she prefers to be called, Paquita la del Barrio ("Paquita from the Hood")—is no stranger to Latino culture. She has nearly 40 albums available and has been broadcast on nearly every Spanish radio station and TV channel. The reason Paquita is such a big hit in Latino culture is simple: she's uncut and never afraid to put her thoughts out there. She's known for her ranchera songs (a sort of Mexican version of country music), in which she sings about her disappointment in men. But instead of sorrowful laments, Paquita's songs are confrontational, usually referring to men as snakes or vermin. Paquita is a huge feminist, and insists that "las mujeres mandan"—a woman should have the final say over everything. Because these types of sayings have been known to piss off many men, her fan base mostly consists of other women who, like her, have been done wrong or been mistreated. Her catch phrase "Me estas oyendo, inútil" roughly means "Are you listening to me, you useless man?" Paquita says this often, both in concert and in several of her songs, and she usually follows it with other comments about men being good for nothing or simply embarrassing. In her hit "Hombres Malvados," Paquita comments on serial cheating by both her grandfather and father, and states that she hates all men for "letting out their dogs" and measuring their machismo by their conquests. "Tres Veses," a song about cheating on her man three times and then tossing him to the curb, was written to make all the "useless men" suffer. And in her biggest hit "Rata de Dos Patas," she refers to her lover as a filthy two-legged rat who is the scum of life and deserves to die. Beyond the bleach-blond hair and flashy clothes, Paquita is a symbol of female empowerment with a large audience of Latino women who are tired of the tradition of staying with men who treat them like crap. More remarkably, she began her career in the 1970s, when views like these were seen as outrageous. Paquita encouraged women to reevaluate their self-worth and question Mexico's then-sexist male culture. At 65, after over 30 years of performing, Paquita continues to bash men in defense of women everywhere.